Recently, Pookie did a new level of bead threading at his occupational therapy session. He is now threading pony beads onto a pipe cleaner. Huge step forward for someone who has to be taught to use his fingers due to no natural fine motor development. Because of all the developmental delays that he is working through in the OT sessions, I have always tried to incorporate some of those activities into his homeschooling. While out shopping today, I went to the Dollar Tree store. I absolutely LOVE going there to get some of the craft supplies we use for OT at home. This trip, I found pony beads and pipe cleaners in their craft dept. A couple pipe cleaners and a dish of beads in a bowl will make a great Montessori-style activity to help with his fine motor development. At the Valentine’s display area, I found a package of 50 plastic red hearts about 1/2 inch in size. 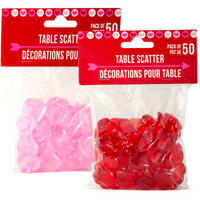 These are perfect to use on Valentine themed do-a-dot pictures. Instead of using the markers, Pookie can place one red heart in each circle on the page. The hearts can become a math manipulative as well as something to add to a sensory bin. There were many other items that would make fun sensory bin additions or manipulatives. The longer I homeschool Pookie, the more I am seeing how easily his OT activities can be used in a Montessori styled setting. It is easy to recreate the OT activities and place them in baskets or bins for Pookie to work with throughout the week. Soon, I will be restructuring Pookie’s homeschool area. The workboxes were a good idea, but in practice, they were not as effective as they could have been. For Pookie, out of sight is out of mind. He didn’t like to open drawers to find his next activity or project. So, this time I will be setting up shelves with open baskets and bins. It will resemble a home Montessori arrangement. The hope is that Pookie will see the activities and be a little more spontaneous in doing them. Anything that brings about more independence in his world is the goal.